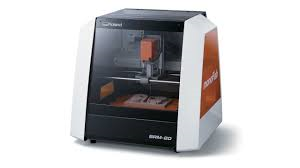 【Roland DG】monoFab SRM-20 | Products （3D Printer ）| MASS CO., LTD.
As a small milling machine, the SRM-20 offers compact size and powerful functionality at an affordable price. Production of realistic parts and prototypes is made simple and convenient with a device that fits into any office, home, or classroom environment. For users looking for advanced milling capabilities without the need for expert operating skills, the SRM-20 is the easiest and most precise CNC mill in its class. The SRM-20’s VPanel controller provides a simple interface for adjusting tool position and moving the cursor to set the milling starting point. The VPanel also allows easy control of feed rate and spindle speed with pause and resume operation, plus tracking of X,Y,Z axis milling with a numeric readout in millimeters or inches. It’s no longer necessary to change spindles every time there’s a different end mill shank diameter. Now you can replace the collet chuck in order to match the shank diameter for fast setting of the Z-axis base point and for quick tool changes. The SRM-20 has a fully-enclosed cabinet that reduces dust and noise and features a side-window for easy progress viewing. It also features an intelligent safety interlock to that automatically pauses the machine when the cover is opened, permitting milling to resume upon closing the cover and selecting “continue”. The SRM-20 includes the very latest CNC milling features such as airtight sealing technology to prevent waste material from getting inside the spindle and Y-axis, making it resistant to the effects of milling debris and adding durability for long-term operation.